For the 4th day of 10 Days Of OPI I've chosen Bright Lights Big Colour. This colour was suggested on my OPI collection post and to be honest I'd only used this colour once, and I have no idea why! After painting my nails with it again I've found a new love. 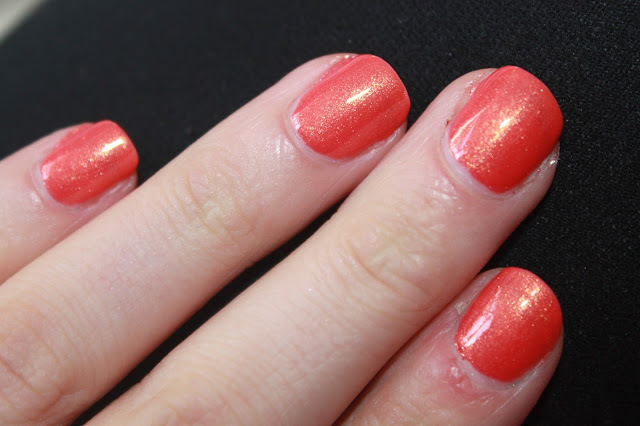 The coral varnish packed with gold shimmer, I cannot wait to wear this in the bright sun in the summer. When I wore it, all I could think of was resting on the golden sands and swimming in the cool sea. I love this shade and it only needed 2 coats! It looks so gorgeous on the nails and I can't wait to paint my nails with it again. Thank you Hillary for suggesting it, I've found my summer shade! Like many other of the OPI polishes this lasted a good 4-5 days before any chipping occurred. It's not too late to suggest what colours you want in the 10 Days Of OPI, comment on this post here. What do you think of this shimmery shade? What's your favourite colour so far in the 10 Days Of OPI series? And what's your all time favourite colour? and I respond to all comments! I really love coral. Just bought a coral nail varnish the other day but am now starting to wish I'd bought this instead, it's gorgeous! This is super pretty, reminds me of a lipgloss I have! I love this colour! Such an usual shade with the gold shimmer, making me yearn for the summer!! What a great summer color!! I'm glad you have found a new love for it!